some treasured friends celebrated their birthdays recently. my girl and i made a pot of chai, a playlist (it's still all about Lanie Lane at the moment) laid some treasures in front of us and we got our craft on. 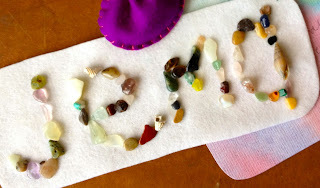 some wool felt, a bottle of glue and hundreds upon hundreds of tiny tumbled crystals that my girl has been collecting throughout the year (hidden in various sandpits, along ocean shores and other places of interest throughout her habitat). cut to size, name squeezed out in glue then she carefully chose each treasured crystal to fill up the letters. so simple. she loved it. i loved it. 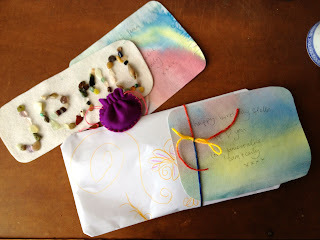 we made a little treasure pouch as well, filled it full of more hand selected crystals from her collection, wrapped them in her drawings with cards made from his paintings and sent them on their way, to the treasured recipients. by all accounts, they were received with love and are, indeed, treasured.